Stevens plays David, a soldier just returning home from a long tour. His first stop upon returning to American soil is to the family of Caleb, a fellow soldier who died in combat and who David promised he would check in on his family. At first, the family (mother Laura played by Sheila Kelley, father Spencer played by Leland Orser, teenaged daughter Anna played by Maika Monroe, and young son Luke played by Brendan Meyer) are unsure what to make of David, this friendly and seemingly peaceful stranger who's just appeared on their doorstep. Laura, still jostled by the loss of her oldest son, jumps at the chance to welcome David into their home. Slowly but surely, the other members of the family fall in favor for the new addition, but you know the drill. David's secret past is about to catch up to him, and more than a few innocent people are gonna get into the crosshairs. As with You're Next, Barrett's screenplay moves quickly, the skills David picked up while serving coming into fast, impactful play against a couple of school bullies who have targeted Luke. The film makes no bones about the badassery stored inside David, but it finds its room to breathe in developing his connection with the individual members of the family. They each have their own secrets, normal, banal secret that quietly haunt most, American families. David's secret, however, is a ripper of a revelation, and, also like You're Next, its cool, kinetic drive keeps you guessing where the next turn is going to lead you. The Guest's kinetic pace is assisted tremendously by Wingard, a director who finds a way of pouring on the slickness and style with minimal help from a modest budget. Regardless, the action that kicks in throughout the film is as polished as anything big-budget Hollywood has to offer. The explosions may not be quite as big, but damned if they don't still pack a cool kick. Likewise, Wingard cranks the atmosphere volume up a few notches, Steve Moore's poppy and hip score adding to the coolness of it all. 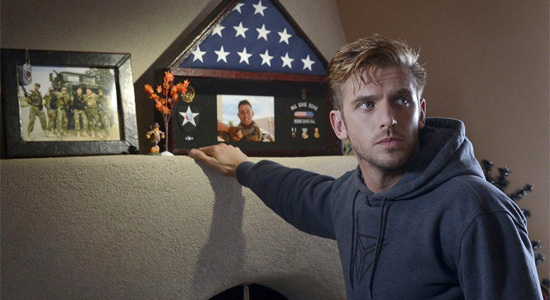 The mood gives The Guest's Halloween setting a supporting nudge for genre fans and providing a nostalgic, somewhat tongue-in-cheek mood for the '80s-inspired thriller.